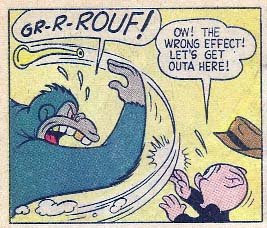 The House of Cobwebs, headed up by Karl LaFong, is a scan/text heavy blog about old comics by a reader from across the pond. Karl has only posted 13 times since March, but what he lacks in quantity he makes up for in quality. I hope he starts posting at least weekly because it is certainly on my must-read list. 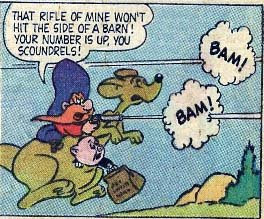 And where else can you see a kangaroo kick the crap outta the Men from U.N.C.L.E.? 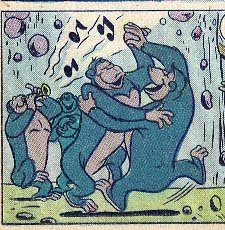 Gorillas love cutting a rug!! Gorillas love the dinner bell! 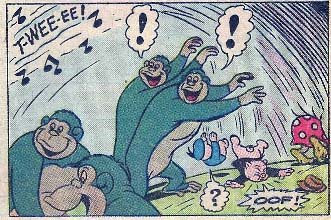 Gorillas hand out all of the birthday spankings!! "Good Lord, Martha!! It's that horrible Luschenat brat trying to sell us some more of that crap of his!" "Don't answer the door, George! Remember how he tried to sell us that Mammal-flavored Jelly of the Month Club?" "Urrf. Don't remind me. Or how about those tickets to the Of Mice and Men opera? " "How about the time he was peddling New Coke?" "That wasn't nearly as bad as when he was selling the Sham-Wow?" "But you have to admit, he's not nearly as bad as that Gore kid that continually keeps trying to get us to buy into that whole 'carbon-offset' crapola"
"Well, he did have a good slide show to go with it." 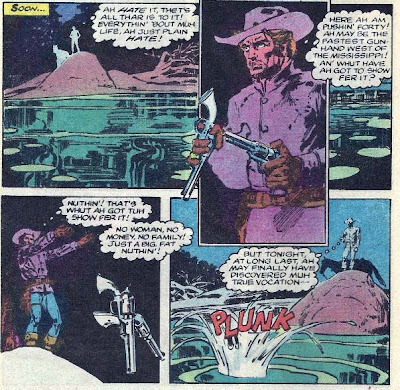 Yup, I'm out of town on business this coming week, so no Jonah Hex #84. I do have a few regular features loaded & ready to go. In the meantime, did anyone else read the latest Superman/Batman? It seems that this book really hits some high points on my list of pleasure reading. The entire book is placed outside of the main continuity that is currently racking the DCU and I like it. That is how World's Finest was for it's entire run. What is even better is that this last issue of Superman/Batman gave us a nice little hat-tip/explanation for all that weird World's Finest Haney-crazy that filled the books. It seems like every last issue was a computer simulation that Batman has been running on the computer in the Bat-cave. Yup! True! Look at the last page of the current issue and you'll see references to the Super-Sons (Gotta post some of THAT craziness soon!) and even Batman Beyond. A great story and a fantastic done-in-one. My name is Superman & I'm from Kry...uh, out there. Yup, looks like DC Comics has lost the rights to the real estate known as Krypton. On a side note, DC stills own the word kryptonite. But they have no idea where that rock came from. ...that pops in the sunlight! Of course, Orville Reddenbacher steals the only one and keeps it all to himself in his wonderful underwater lair, guarded my unicorns with LAZER-EYES!!! ..unless, of course, you start sitting around on your fat posterior, playing Halo or WoW. In that case, you had better hope that grinding hogs and mining gold pays off better than hitting the bricks and selling American Seeds!! Spent last week in Illinois at an In-Laws wedding, this week is bathroom demolition/renovation, next week is business trip to Utah. 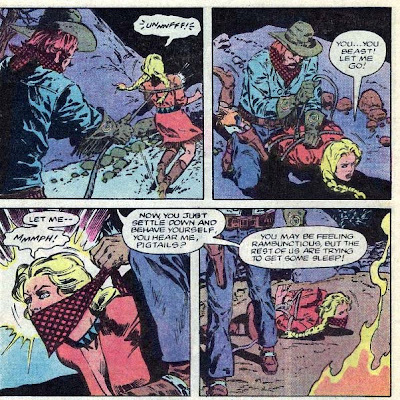 Luckily I have gotten a few posts pre-posted and scheduled, but the review of Jonah Hex 84 is getting to be very very elusive. I'm still working on it though, slowly, slowly. Good news is that my printer/scanner/fax/steaming pile-o crap is finally working and has stopped dumping it's IP address randomly. On related Jonah Hex news, I scored these little beauties off ebay. That's right, four Jonah Hex temporary Tattoos from San Diego Comic Con. Love the look, all cattle-brand burnt looking. THIS is the lettering that should go on the poster, not that blue metallic Transformers crap. 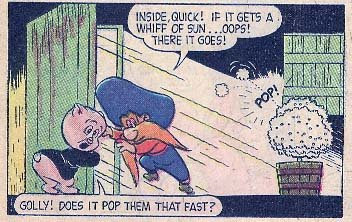 The World of Porky Pig is wonderfully wicked awesome. Who wouldn't want to live there? Not only do pigs walk around talking and wearing no pants, there are things like spies, weird inventions, fantastical bizarre foreign lands, and, of course, Cicero, Porky's nephew. ..there is a lot of gunfire on the Australian Public Transportation system! There, Eric Ritzenthaler has easily explained Capitalism in one sentence. Of course, it would have been pretty sad if he had gotten the prize of someone else's choice, which he didn't want, but let's not postulate what would happen if the Federal Government took over American Seed. hmmmmm, maybe...... nah, it's just TOOO crazy!! 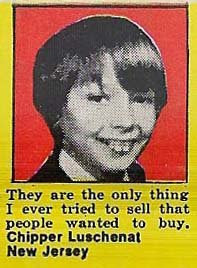 Ad-man #1: Ya know, kids that get run over by cars don't chew much gum. 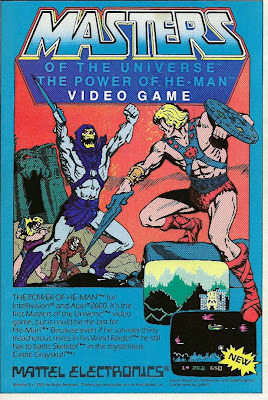 Ad-man #2: That's a great idea! 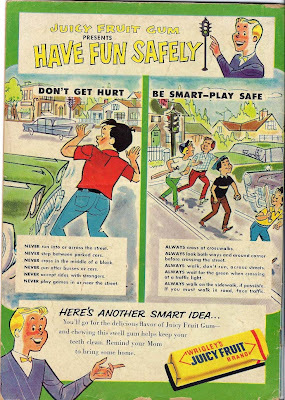 We'll run a safety campaign, the parents will love us and the fewer injured kids means more gum chewing!!! Yup, I'm starting to hate HP products. We purchased an HP Photosmart C7250 All-in-one with a scanner/fax attachment. We could never get the fax to work and the scanner would work in wonky ways (scanning with strips in the scan, scan with a yellow tint, scan with a purple tint) and finally we called customer service to get the fax working. My Lovely Wife spent 4 hours on the phone with the fine gentleman with the heavy accent but to no avail. I then spent 2 more hours on the phone with a delightful lady with a heavy accent and she determined that the unit was broken. They shipped a replacement and it worked just fine. Until yesterday. That is when the printer stopped working. Well, stopped working when you try to print something. It will print a self test just fine, it can find the network just peachy, but my network knows the printer is there but nothing will print. I have reconfigured the network, reattached the printer to the network, downloaded updates and am working on uninstalling/reinstalling the printer. I am not looking forward to 7 hours of tech support since I have family coming in today and I'm leaving for a trip next week. 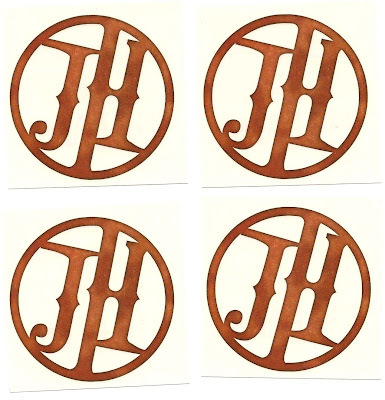 On the plus side, I did win an ebay auction for some Jonah Hex movie logo tattoos as well as the complete run of Jonah Hex: Riders of the Work and Such. I haven't gotten the tats yet, but I have read the RotW&S. I'm NOT looking forward to doing an indepth review of this....'garbage' is the wrong word, since it insults the usefulness of garbage, but I'll think of something else by the time we get to that. We still have to finish up Jonah Hex, then move through Hex, and also trot through Jonah Hex; Two-Gun Mojo. On the downside, after Riders, we will be forced to read Jonah Hex: Shadows West (the only book that I ever purchased, read, and returned to the store, not even wanting my tainted money in return). Anyway, hope ya'll's day is better than mine. Wow, I'm glad he cleared up that E.S.P. thing by defining it. For a moment I thought that these seeds had been bred with Uri Geller or something really freaky-Ka-Jeeky like that. Brrrr, gives me chills just thinking about that. 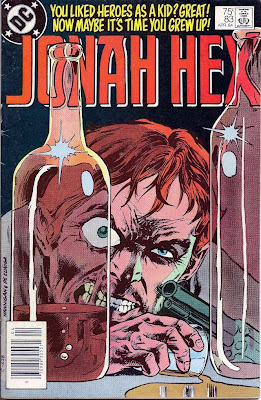 Jonah Hex #83 "Blues in the Bottle Stopple in My Hand!" "Blues in the Bottle....Stopple in My Hand!" Last week I said that this would be the end of Matching Dragoons. It is & all will be explained later. The title is from an old Blues song, according to Mr. Fleisher (who is now also the editor, having taken over from Ross Andru) and we'll learn how it fits in right quick. But first, Jonah is still beating the crap out of J.D.Hart (this issue backing up just a few minutes before last issue finishes. This seems to be a new pattern here.) After Jonah finishes up and gets yelled at by Mei Ling, he rides off into the night. But he is being watched by two thugs who follow him into the darkness. The next afternoon, Jonah rides into town, mentally griping about Mei Ling and looking forward to finding solace in the arms of Emmy Lou. However, when Jonah gets to the hotel, he learns that Emmy has left for St. Louis and in his anger, he stomps off to the saloon. Several townsfolk watch Jonah head for the bar and one of them asks the sheriff what HE is going to do about Jonah. The sheriff wisely says that he can't do anything until the law is broken. Meanwhile, many miles away, Emmy Lou and her kidnappers finally stop to set up camp. That is when Emmy notices that two of her abducters are female. The ring leader, Brett, tells Camille to start cooking and Sandy to lay out the bedrolls. He orders Emmy to get some firewood and when she refuses, he slaps her right upside the head and demands she get the wood. Back in town, Jonah is getting more & more drunk, bottle after bottle. At one point a cork is jammed in a bottle so he smashes it across the table and pours out the remainder. Suddenly there is a shout from the street. The two men that have followed him are calling him out. Well, one of them is calling Hex out, the other is telling the first one that they should wait for their boss and the rest of the gang. The brave/stupid one knows that Jonah is drunker than a skunk and figures that the two of them can take him on. Jonah staggers out with a bottle in his hand and takes a long draw on it. He wipes his mouth on the back of his hand and outdraws both men, dropping them in the street where they stood. Much later that night, Emmy is convinced everyone is asleep so she slowly starts to sneak away. Just as she starts to run, she is suddenly lassoed and Brett hogties and gags her before he goes back to sleep. In town, Jonah, unable to obtain a hotel room, is continuing his drinking binge in th eloft of the local livery. Sinking deeper into a drunken stupor, Jonah doesn't hear the locals leading out the horses as they prepare to torch the entire structure (promising the owner that they'll all picth in to build him a new one). The place lights up like the fourth of July and Jonah is awakened by the heat and smoke. He manages to jump out a window on the lower roof, locate his horse, jump on it and take off, but not before kicking the ring-leader into a large puddle. Later, Jonah is resting near a lake, still drunk, still bemoaning his life. He's the fastest gun in the west and what good does it do him? He has no woman, no money, no family, just a big fat nothing. He takes his matching Dragoons and heaves them into the center of the lake (see? I told you it was the end of Matching Dragoons! What? You thought I was...what? 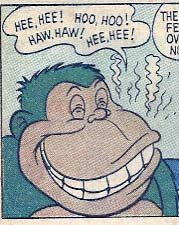 hee hee). He grabs a bottle that he has brought along and following in his father's footsteps, drinks himself unconscious. The next morning, Jonah is suddenly and rudely awakened by one Catherine Rebecca Smollett, owner of Christian Temperance Farm, a place for men driven to the squalor of liquor to dry themselves out and find redemption in the Lord Jesus. Smollett picks up Jonah's hat and reads his name in the hatband. She notes that Jonah, in the Bible was swallowed by a great fish. Hex appears to have been drinking like a great fish! Still groggy from his previous day and night, Jonah staggers up onto her wagon and allows Catherine to take him to the farm. Back in town, the friends of the dead gunmen show up and demand of the sheriff which way Jonah Hex went. The sheriff tells them that he has no idea, but they head out to find Hex anyway. Back at the farm, Catherine & Jonah pull up. Catherine tells Jonah that it's about suppertime and he can clean up in the bunkhouse. Jonah goes inside and pulls a small bottle out of his pocket. As he takes a swig, another resident of the farm grabs the bottle from him, telling Hex that Catherine works hard to keep that terrible poison out of their bodies. He tilts the bottle back and Jonah tosse s left hook into his jaw, sending the bottle sailing through the air. Jonah dives for the bottle, just as Cathering enters the bunkhouse. She takes the bottle and announces that dinner is ready. Over the next few days, Jonah dries out at the farm, repairing fence, splitting wood, fixing wagons until finally the three men that have been searching for him come riding up to the farm. The bunkhouse buddy comes running to tell Jonah about the three men just as they show up using Catherine as a human shield. that brings the second one running, who fires into the bunkhouse. 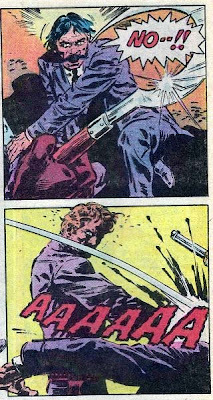 But, Jonah Hex is not IN the bunkhouse, he is on top of it and... Jonah proves that he can be pretty violent even without his pistols. Shortly thereafter, Jonah is mounted up and bidding farewell to Catherine. She says that she wishes Jonah could stay, but for the sake of the Farm, she feels that he should go. She wants him to stay long enough to be truly saved and Jonah replies that he is pretty nearly saved, least as he is ever likely to be. Timeline: I would say this one covers about a week. So we are probably still in April 1878. I know we are because I read the next issue, but I'll cover that then. 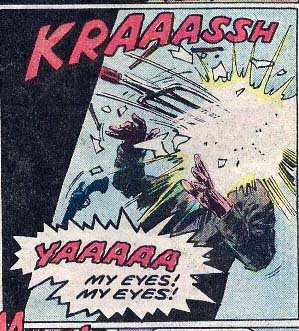 A nice gruesome issue, pitchfork to the face, sickle to the head, ya know, fun stuff! Ed Hannigan starts designing the covers and I have to tell you that the next 9 covers are some of the best in the entire series. The perspective through the whiskey bottles, the antagonistic blurb at the top, the gruesome glare of Jonah's eye...perfect! The story overall was a good one. Catherine Smollet reminded me of Katherine Hepburn in Rooster Cogburn and the Lady. I don't know if it was intentional, but it was a nice touch with a few slightly comedic elements thrown in when Jonah first arrives at the farm. Next Issue: Jonah's life gets even more interesting as he ends up in Mardi Gras! !